High Water™ delivers customized action plans for clients whose facilities are threatened by sea level rise and flooding. Historically, flooding has proven to be the greatest single cause of property damage. To this day, assets, facilities, and communities are designed and insured based on historical data of weather patterns, extreme rain, sea level, and flooding. However, these existing designs may be insufficient because flooding caused by what once was considered an extreme weather event is now routine. While increased flooding is multifaceted and a long-term threat to the global system, little is being done to prepare communities, businesses, and government agencies for the impact it will have on their security, mission, and operations. 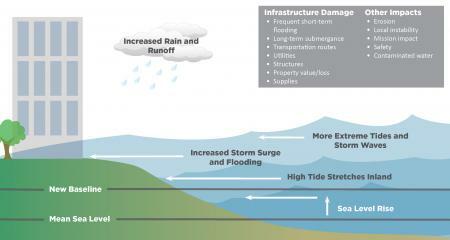 Increasing storms, tides, and sea level rise create a new baseline from which flooding is calculated. Their impact should be determined through a scenario-based modeling and comprehensive risk assessment. That's why we've partnered with John Englander, author of High Tide On Main Street: Rising Sea Level and the Coming Coastal Crisis and founder of the International Sea Level Institute, to provide clients with scientific models and long-term solutions. To get started with an assessment of your facilities, contact Patrick Schlecker at patrick.schlecker@markonsolutions.com or 302.545.4675.